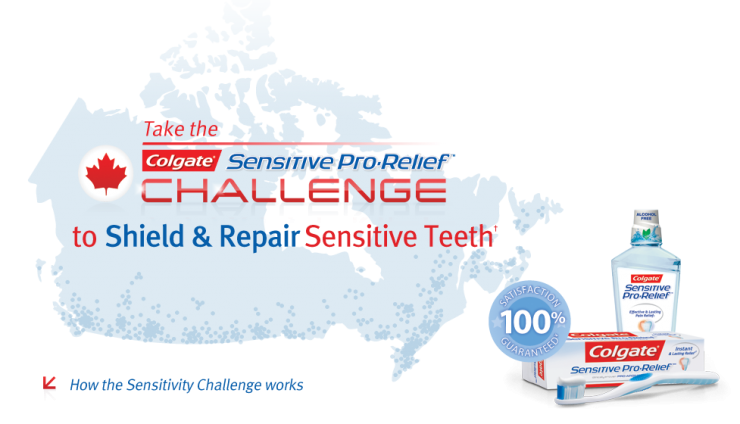 Take the Colgate Sensitive Pro-Relief Challenge! #ColgateSensitive - Frugal Mom Eh! One of the worst things nobody tells you about being pregnant is sudden and horrible teeth sensitivity thanks to all those hormones and increased blood flow. Well that, and your favourite pair of heels will never fit you again, but that is a story for another day, and sadly there is no fix for that other than buying new shoes. Anyway, back to my teeth. It all started early on in this pregnancy. I hadn’t experienced it with Keira, and didn’t even know pregnancy could cause it. Imagine my surprise when I noticed discomfort after drinking some tea! I wasn’t happy when I realized later on that ice cream wasn’t so nice to eat anymore because of the same discomfort. I didn’t know why, but suddenly I was experiencing sensitive teeth… hot, cold and even just anything sweet caused me tooth discomfort. Sometimes even just breathing cold air in through my mouth would set it off. Sensitivity occurs when your enamel erodes or your gums recede, which exposes thousands of microscopic channels which lead to your tooth’s nerve centre. Sensations are carried down these channels directly to the nerves, causing pain. During pregnancy this is caused by inflammation of the gums which cause them to recede just enough for sensitivity to ruin the next 9 months of your life if untreated. I was asked to take part in the Colgate Sensitive Pro-Relief Challenge and I was interested to see if it would live up to all the hype. Colgate Sensitive Pro-Relief (CSPR) toothpaste is formulated to shield and repair sensitive teeth for long-lasting protection (with regular use). Most other sensitivity toothpastes contain potassium nitrate, which primarily numbs the tooth nerve, masking the pain of tooth sensitivity, and will take 2 weeks of use before relief is delivered. Colgate Sensitive Pro-Relief toothpaste works by plugging the channels that lead to the sensitive tooth nerves, to block the pain. With regular use, it builds a long-lasting protective barrier that acts like a seal against sensitivity. After eating some delicious cherry pie I found my whole mouth bothering me but one tooth at the back was particularly painful so I decided it was time to put Colgate to the test and rubbed the toothpaste directly on that back tooth with my finger for a minute after having brushed the rest of my mouth with a soft toothbrush. At first I didn’t think anything was happening but by the time I was done I couldn’t feel even a little bit of discomfort from that tooth. I couldn’t believe the instant relief I felt! Don’t take my word for it though, take the Colgate Sensitive Pro-Relief Challenge yourself! 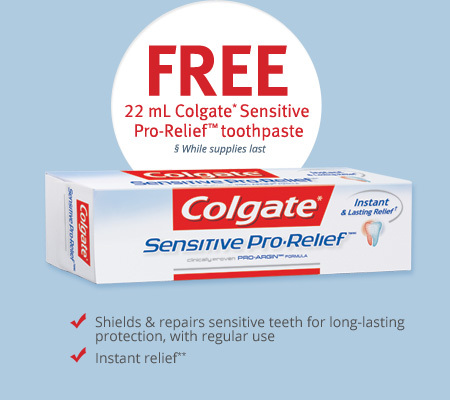 Just sign up for a free sample of Colgate Sensitive Pro-Relief toothpaste (only 1 sample per house hold) and try it for yourself. The free sample includes 1 trial size tube (22 mL) of Colgate Sensitive Pro-Relief toothpaste and 1 coupon for $1 off a Colgate Sensitive Pro-Relief toothpaste. When your sample arrives, rub the toothpaste directly on the sensitive tooth with your fingertip and gently massage for 1 minute. Next eat or drink something that triggers your tooth sensitivity, and discover the instant relief and freshness of Colgate Sensitive Pro-Relief! Next, review the toothpaste online for a chance to win one (1) NESPRESSO® U Pure Orange coffee machine and one (1) gift basket containing a 1 yearsupply of Colgate Sensitive Pro-Relief products! I have very sensitive teeth, this toothpaste is awesome! I highly recommend it!